Plant Type: Shrubby Perennial -- bushes out more with age. A tropical milkweed -- Not Native to Florida, but a major nectar source for Monarch Butterflies and food source for their caterpillars. Usually found growing in sandy soils in disturbed areas. Purists may not want to include this particular species in their native garden, but for the less fussy this is a must for your butterfly garden. With the exception of the flower color, this plant looks every bit like its native cousins. Soil Requirements: Usually found on poor sandy disturbed soils, but produce more and larger clumps of flowers when watered and planted in improved soil. Easy to grow. Water Requirements: Drought resistant once established. Leaves: Oval, lance-shaped, or long and narrow; stems usually have a milky sap. Flowers: Five-petaled flowers in clusters, white, greenish, yellow, or orange depending on species. Long blooming season usually from spring through fall. Fruit: Pods, which split open when ripe allowing fluffy seeds to be distributed by the wind. 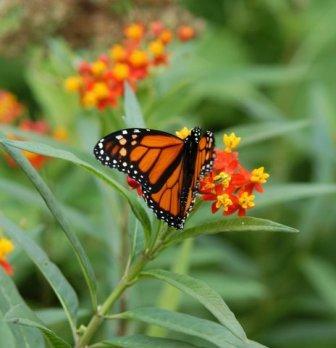 Uses: Essential for butterfly gardens where they serve as larval and nectar plants. Propagation: Seeds, cuttings. Use caution as this plant will readily self sow in your yard which may make it a weed problem.